"My mother always represented the family, because my father never went to church. My father stayed home and waited for the white bakery bag to arrive. For as long as I can remember, every Sunday morning, my mother went to church and stopped at the bakery on the way home. Every Sunday morning my mother bought jelly doughnuts. Cookies, cakes and cannoli were bought on weekdays. Sunday was jelly doughnut day. It was like taking Communion. I'm a Catholic by birth, but in my personal religion, the Trinity will forever be the Father, the Son and the Holy Jelly Doughnut." 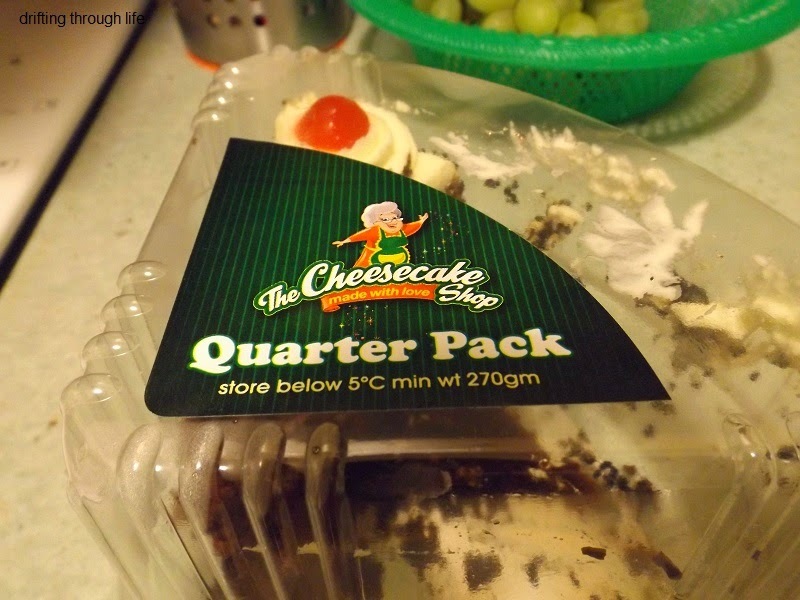 "I heaved myself out of my chair and went into the kitchen and got the cake. As soon as it hit the table, the crying stopped. If we pay attention to anything in this family, it's dessert." today's giggle isn't googled, nor did it come to me via email. I found this in our very own Sunday Mail. 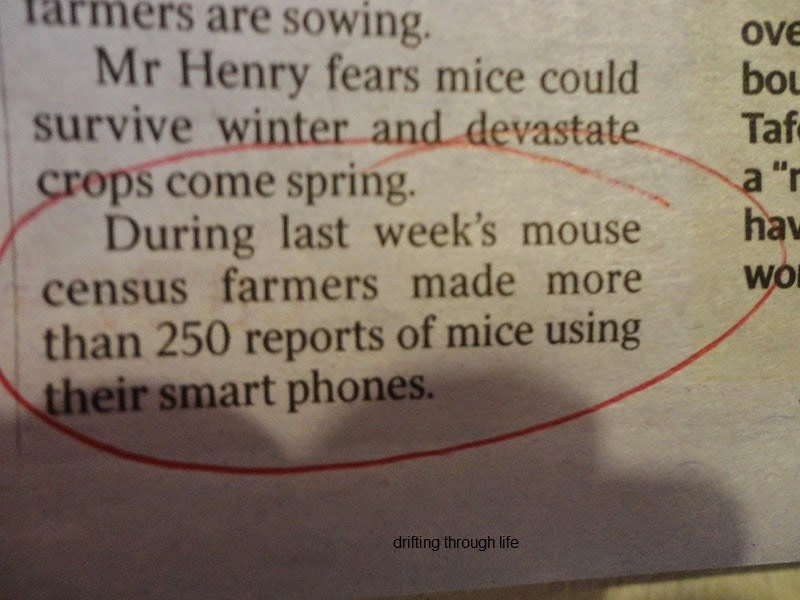 "During last week's census farmers made more than 250 reports of mice using their smart phones." How about that?? The mice have their own smart phones! We breed them clever downunder! "Australia's first mouse census has exposed SA as having the worst mice infestations. The CSIRO is encouraging farmers to use their smart phones and report mice levels to avoid spring plagues. With high levels of infestation reported near Port Victoria, Lock, Pygery and Ceduna, Steve Henry from the CSIRO is warning there is "cause for vigilance" while farmers are sowing. Mr Henry fears mice could survive winter and devastate crops come spring." I had the ultrasound this morning, I was a bit worried about it, not because they might find something, but because I had to have a full bladder for it. The machine gets a clearer picture when the bladder is full. My instructions were to empty my bladder by 9.40am then drink a litre of water (a whole litre! )by 10.30am and hold it until the ultrasound at 11.10am. Normally, my bladder doesn't like holding on, but if I haven't been drinking coffee (with sugar) then it is easier. So I had no coffee after lunch yesterday, and drank a litre of water between leaving home and arriving at the medical clinic. Then I sat and waited. I was just beginning to feel that if I didn't visit the toilet soon, there'd be a puddle on the waiting room floor, when S called me in. The ultrasound didn't take long, then she showed me to the nearest toilet and asked me to come back in so she could take images of my kidneys as well. "Anyone who voiced a critical opinion got fitted with cement booties and accidentally took a dive in the Delaware River." an update on the bladder thing, my last two urine samples have been clear, no blood in them at all, so a cystoscopy isn't warranted. I'm to have an ultrasound on Thursday, oh that's today, (I'm typing this on Tuesday night) and if that is also clear, then the bleeding episode will be put down to one of those odd, once off, episodes that happen for no reason at all. There is nothing else wrong with me in that area. No infections, nothing. So we'll cross our fingers and hope it never happens again. In other news, you won't believe what I did last Monday. I never iron anything anymore. again with the tree trimming! There are witches hats on the road and trucks right outside my front door! Men in safety vests and hard hats. I can't tell from here which tree is being trimmed, maybe the big old Yew tree, maybe the Lilly-Pilly which is dropping berries all over the footpath. Berries which are now a layer of pink mush from people treading on them as they walk along. Hopefully it is just a "trim those branches away from the wires" thing. It's that time of year, so probably that's what it is. Certainly I'm not going out into the cold in my stripey pink pyjamas just to find out. 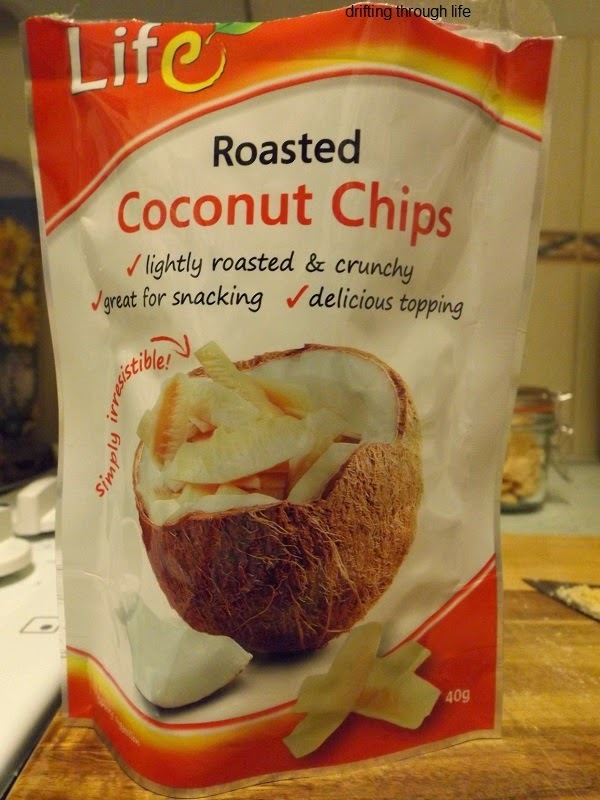 roasted coconut chips, available in the dried fruit aisle of Woolworths. I chop them finely to add to my breakfast porridge. and craisins, (dried cranberries). these are already small, but I chop them a bit too. on with the lid and leave to soak until morning. Then add a splash of milk, simmer a minute or two and eat. Yum. and what's this over here? a delicious pear, ready for my after dinner snack.